This year a lot of spinach yielded in my garden. I made many new recipes like green vegetable cake, Peanut butter green smoothie, green chicken, spinach with cheese etc. I like to share my peanut butter green smoothie recipe with my healthy food lover friends. Gradually all spinach recipes will be published in this site soon. In addition to peanut butter green smoothie recipe, here I described another two smoothie recipes for you. All the recipes are very easy that your kids even can do it for them. Hope you will enjoy the recipes. This smoothie is healthy and as well as delicious. You can easily prepare at any time. Peel banana and smash it with hand or spoon. Keep it aside. 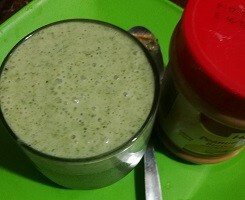 Take a blender and put milk, banana, peanut butter, spinach paste, and sugar in a blender. Blend the mixture for 2- 3 minutes. Take the peanut butter green smoothie in a serving glass. Your healthy peanut butter green smoothie is ready to serve. 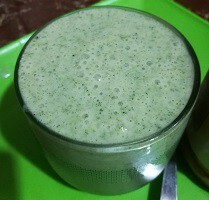 This smoothie is very healthy and tasty especially for kids. Peel mango, separate from the seed and cut into small pieces. Make sure the mango remains clean while dressing and cutting. Put all mango slices in a clean blender. Add liquid milk, peanut butter powder, and honey to the blender. Switch on the power of the blender and Blend it for 30 seconds. Add ice cubes and blend it again. Switch off the blender when bending is complete. 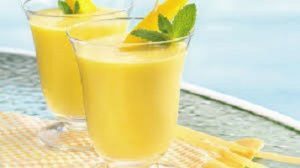 • Take to drinks glasses and serve yummy, healthy and tasty mango smoothie with peanut butter. If you don’t like banana you can prepare the smoothie with banana. This smoothie is tasty, healthy, and delicious, especially for the patient. Peel banana and cut into small pieces. Open the lid of the blender. Add banana, liquid milk, peanut butter powder and honey to the blender. Switch on and Blend it for 30 seconds. Add the ice cube and blend it again. Switch off the blender after 1 minute. 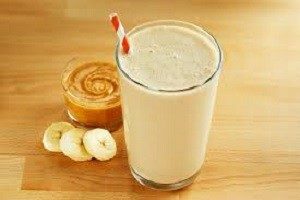 • Serve yummy, healthy and tasty banana smoothie with peanut butter. If you like my smoothie recipes please share the recipes with your friends and family. I love to cook and like to share my delicious food recipes with my beloved friends.